Hello players. Welcome to the largest database of answers to Mystic Words game. Word based puzzle games have received a lot of attention in the recent past among smartphone users. In fact, people prefer to play these games when they are free. The simplicity and convenience associated with the word based puzzle games has contributed a lot towards the above mentioned fact. When it comes to the word based puzzle games, Mystic Words holds a prominent place. It is somewhat similar to the 7 Little Words. Get all the answers to all levels (or categories) of Mystic words game here. Download mystic Words for iOS (Iphone/iPad) from this link. At this time there si no version for Android. The developers are working on it, so as soon as a version for android users will be available, we will post the download link here. Note: there is a game called “mystic words” on Google play, but this has nothing to do with the mystic words game found on iTunes. There is no version of this game on Facebook games. Again, if a version for facebook users will be available, we will provide you with a link. Some people are confused about the name of this game. This game is called “Mystic words”, but in the logo the is the number “7”. So a lot of people think this game is called “7 mystic words”. The number 7, actually, refer to the number of puzzles found on each level. If you are a word mystic, Mystic Words would be the best application available out there for your smartphone. It has specifically been designed for the people who are interested in solving mystery of words. As you can see, the gameplay associated with Mystic Words is a simple one. However, the developers have taken necessary measures to make it an engaging game. This game would definitely challenge your spatial and word skills. Therefore, you will get hooked into the game soon after you start playing it. You can start playing Mystic Words with a simple grid that consists of 4 letters and 3 words. The complexity of the game would increase when you proceed to higher levels. For example, you would soon come to a 8 letter grid that consists of 6 words. You will also have to make fast moves when you are trying to solve the puzzles in higher levels. Mystic Words has a daily puzzle mode as well. If you select this method, you will get 12 different puzzles to be completed per day. Or else, you can select the free play mode, which consists of 15 dictionaries, which can be used to generate random puzzles. Each level of Mystic Words comes along with 10 free hints. If you get stuck in a specific level, you don’t need to worry about anything because you can simply purchase more hints at a reasonable price tag. You can also find 11 different achievements in the game apart from three leaderboards. Therefore, people who play Mystic Words are guaranteed with unlimited fun. Some games have some cheats codes where you can increase the number of coins. Unfortunately this is not the case for Mystic words. The only way to have more coins is to buy them. Actually, you do not really need more coins. We will provide all the answers to all levels of mystic words. You will earn 3 coins when passing a new level. You can use later these coins to unlock new levels or show the answers using 60 coins. This makes it so hard as you to pass a whole level you would need 420 coins. 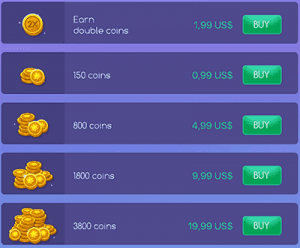 You can buy some coins and I suggest you do, just to reward the createor of this amazing game. However you will get stuck again soon, so it is better to use our website.